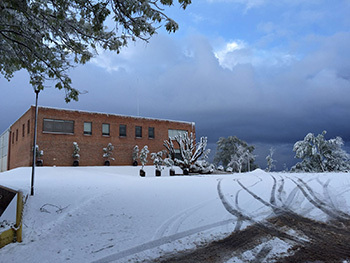 Yesterday, March 9th, snow fell in Jalisco, Mexico for the first time since 1997 leading to fears of an agave production shortfall. BarLifeUK attended a Tapatio tasting yesterday at NOLA, London with 3rd generation Master Distiller Carlos C. Camarena. Before we got underway with a fantastic tequila session and tasting, Carlos had some news for the assembled crowd of bartenders. The message was simple, but a little concerning, buy up tequila now as in 3 to 5 years there will be a worldwide tequila shortage. The reason for this warning was a series of photos Carlos had received from back home in Mexico that morning, it had been snowing in Jalisco. To say this is a rare occurrence is an understatement, in actual fact the last time that area of the world had an excuse for a snowball fight was in 1997. Back then they received around 1cm of snow however the reports place this fall at more like 3 to 4cms, thanks to the recent El Niño storm nearby. Back in 1997 the snow resulted in agave plants up to 4 years old being killed off and those older flowering prematurely in an attempt to save themselves. All of this resulted in an agave, and therefore tequila, shortage a few years later that had devastating results for the industry. Whilst there were other factors at play around that time, not least the fusarium blight, Carlos warned that the snow could result in a similar issue. It is important to stress that Carlos is a long way from home, and won’t know for sure what effects the weather has had on his agave plants until he returns early next week. However the concern was for all to see on his face as he processed the news he had just received from, obviously concerned, colleagues at the distillery. Trying the full Tapatio range, included the rather special Reservas de la Excelencia, was a stark reminder of just how worrying a lack of tequila would be. Carlos’ advice, buy the good stuff now, who knows how easy it will be to get your hands on it in a few years.